The Farmhouse is located on the slopes of Mount Etna, at 550 mt above sea level, in one of the oldest and most fascinating of Etna villages, Trecastagni, called “Belvedere of Etna”. Etna is the highest European active volcano, whose lavaflows offer a unique sight, evocative and amazing. 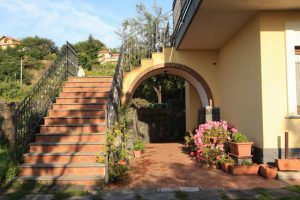 In this context the Agriturismo Biologico dell’Etna is set, in a healthful and restful place, fresh in summer and mild in winter, full of colours and fragrances that allow a pleasant stay. It is about 2 hectares wide, cultivated with fruit plants and vegetables under biological management (AIAB certificates) since 1988, that, together with other products such as sugar-free biological jams, are sold directly in the Farm. The building, recently completelly restructured, well refined with walnut doors and with sicilia “cotto” floors, offers ospitality during the whole year, with at least two-night stays. At Guests’ disposal there are five rooms with bathrooms ensuite also accessible to disables for a total of nine bed places. The farm places at guests’ disposal bicycles for relaxing rides and table-tennis. In the surroundings of Trecastagni it is possible to practice various sports: winter skiing, excursions on Mount Etna, ice-skating, trips in boat and swimming along the Ionic coast, horse-riding, soccer, football, tennis, jym, karting, rides on bicycle and mountain-bike, trekking along the paths of Monti S.Nicolò, Gorna and Ilice. For those who prefer golf, there is a golf pitch 20 km far. During their stay in the Farmhouse, the guests will be given free depliants with routes to places of interest, in order to let them organize their stay as well as possible. Of great interest is the visit of Mount Etna and of the Parco dell’Etna, which begins just 2 km far from the Farmhouse. Proximity to the motorway entrance allows to reach quickly the provinces of Siracusa, Ragusa, Enna and Agrigento.